We took the longest time to decide what to eat since the menu is pretty extensive. Being that we were seated in time for the late night menu (starts at 9:00pm), we took advantage of it. However, Chipmunk decided to go for the full-sized version of the Pork Chop in Creamy Onio n Bacon Demi-Glaze on Rice. 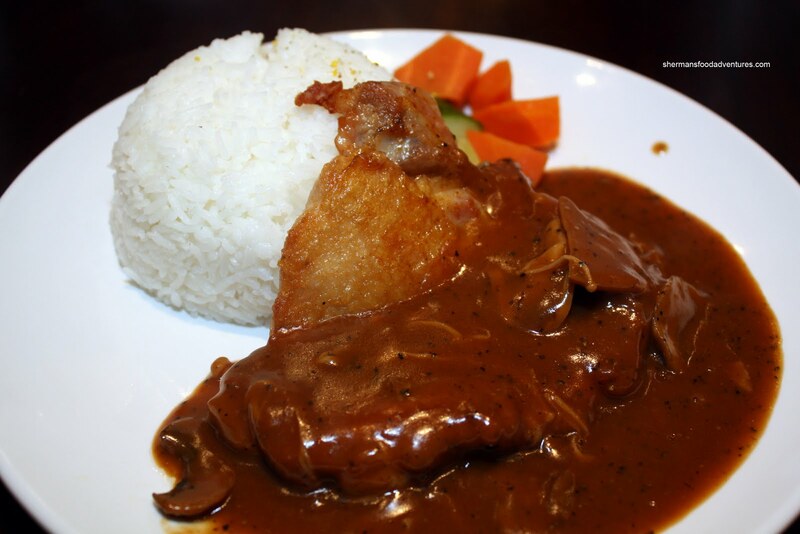 Alright, I'm not even sure if the sauce is an actual demi-glace; but it sure tasted great. I could definitely get the saltiness of the bacon and the sweetness of the onions. 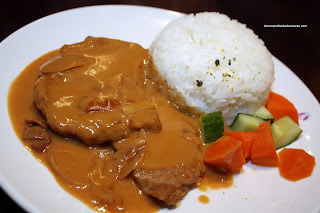 Furthermore, the pork chop itself was super tender and juicy. 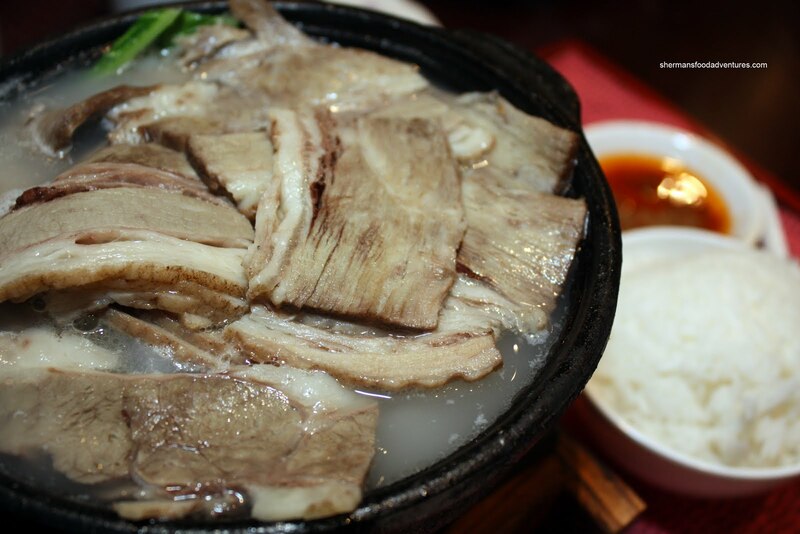 Rollergirl (no, not Heather Graham) went for the Brisket & White Turnip Hot Pot. Looking quite pale and sliced razor thin, the brisket was bland. In fact, the whole thing was bland. I think that was the intention since there was a side of XO sauce. At least the meat was tender. Rice and 2 small dishes rounded out the meal. Emilicious ordered the same hot pot as well (gasp! duplicates!) and she struggled to finish it. Gadget Girl and Mr. Blueberry were quite ambitious and decided on 3 dishes to share starting with the Pork Chop in Coconut & Mango Creamy Sauce with Rice (mini-meal size). Despite looking like a 2-year old plated the dish, it tasted a whole lot better than it appeared. 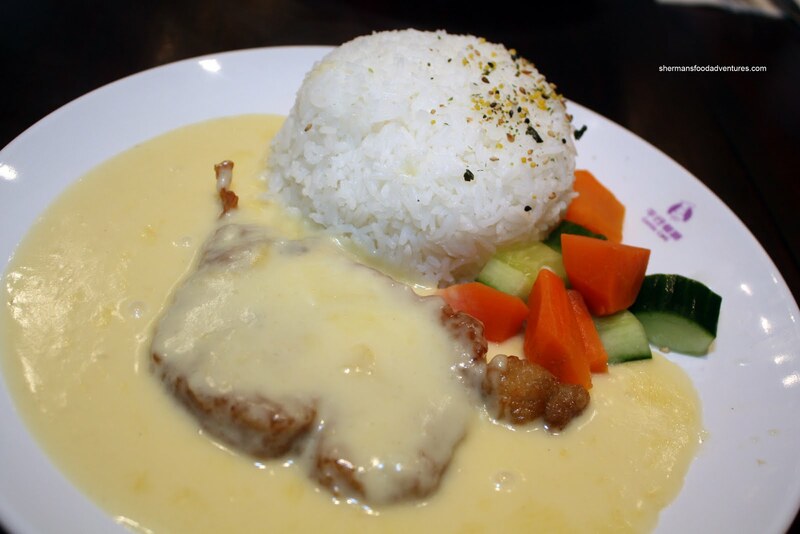 The creamy sauce was not heavy at all exhibiting a refreshing mango flavour. The Boneless Chicken Mushrooms in Black Pepper Sauce on Rice was a stark contrast to the mango sauce. De finitely peppery with a good amount of salt, this was a bold and heavy sauce. By all accounts, the chicken was tender as well. 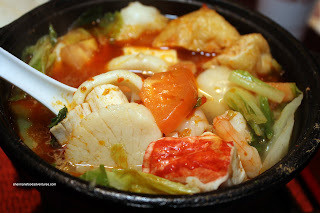 Lastly, they shared the Basa Filet & Tofu Hot Pot. This was a complete bust. 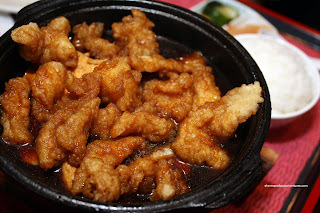 The small pieces of fish were overly battered; thus the texture suffered. The sauce was alright being your typical oyster/soy sauce blend. It was quite watery though. 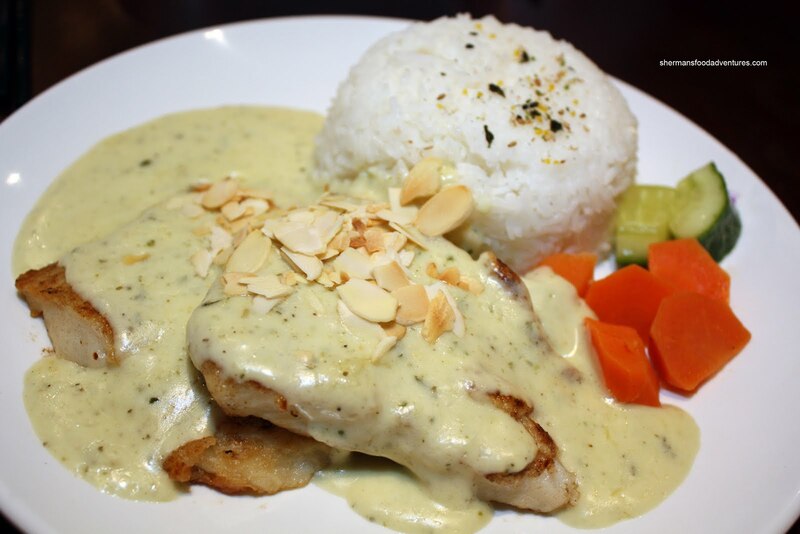 Milhouse ended up with the Fish Filet in Creamy Almond Sauce on Rice. I tried some of the sauce and there was certainly a quasi-pesto thing goi ng on with it. Milhouse and Bear seemed to have the same observation. It was a bit strange; but in the end, it worked, especially with the fish. Boss Woman took forever to decide on her order and finally settled on the Tom Yum Seafood Hot Pot. I warned her that it would be slightly spicy and indeed it was. I should've warned her that by virtue of ordering seafood, she might not get full. Too late, she complained it wasn't fulfilling. I swear she can out eat us all. Personally, I felt there was a good amount of seafood for the money. At first, I was tempted to order one of their signature soup noodles. 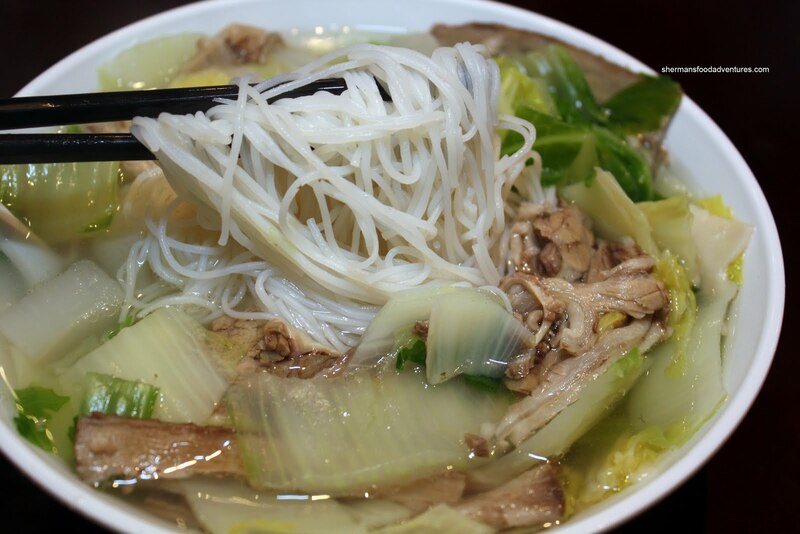 The method here is to choose what type of noodle, soup base and toppings to create your own personalized bowl. In the end, I went for the mini-meal Brisket & White Turnip with Rice Noodle in Soup. Being almost exactly like the hot pot, everything was just plain bland. It wasn't bad per se; but some people may want more flavour. Well, I did get extra flavour in the form of a wayward mosquito that landed smack dab in the soup. I proceeded to pick it up with my chopsticks and chuck it onto the table. I continued eating my noodles t o the horror of the people around me. Hey, I'm Chinese! 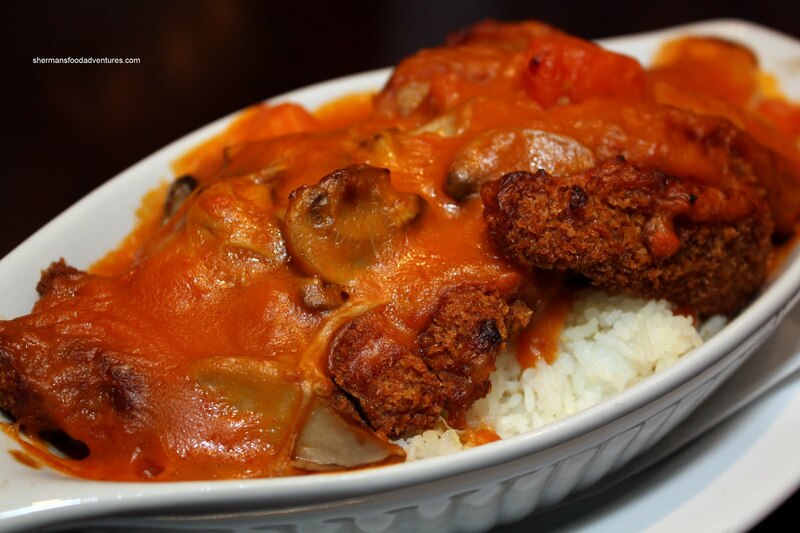 As if one meal wasn't enough, I actually ordered the Baked Pork Chop with Tomato Sauce on Rice. Crispy on the outside while tender and juicy on the inside, I thought the pork chops were perfect. The lack of pork fat made it even better (not that I don't like pork fat; but not in my pork chop). 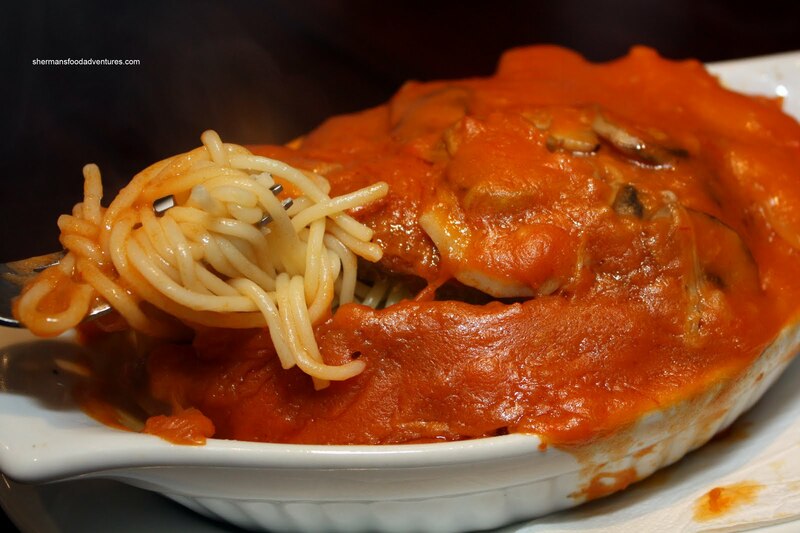 The sauce was a typical Hong Kong-style cafe tomato sauce. It was flavourful with some tartness. Bear ended up with the mini-meal version of the baked pork chop, except with spaghetti instead of rice . For $2.00 less, it wasn't much smaller! I should've ordered that one instead! Most meals include coffee or tea; add $1.00 for cold drinks and $2.00 for specialty drinks. In terms of value, Cattle Cafe has that nailed down easy. Portions are fair for the price while food quality is generally quite good. That would probably explain the constant line of people waiting at the front door. my friend was just telling about this place too, it does seems to be a bit of a buzz surrounding it. The food looks okay, but from the sounds of it taste great. How would you compare this with place like Copa cafe? 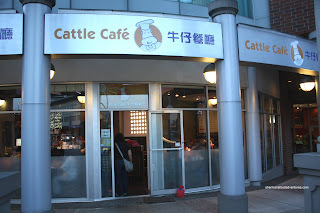 I had a craving for Cattle Cafe this week, but couldn't remember where their new location was. Thanks for reminding me. I really wanted their waffle balls too (which are reputed to be the best in Vancouver). Also, they have the best HK style food in the metrotown area. Consistent food and great prices. So where did I end up? Tom & Jerry's diner on Hastings. I had their salisbury steak dinner but everyone was ordering their $9.95 steak dinner and $5 chicken wings (1lbs) special. Maybe next time. That's funny Jenny, I also thought of Copa for comparison too. Although I live very close to Copa, after the first 4-5 times I got bored of them and don't find their menu particular of good value. Since I work at Metrotown I should try Cattle. I was a Lao Shan Dong regular until their 2nd location The One opened up, and have been going there regularly since. But I do crave HK-style cafe food from time to time. Sherman, what's their price range and average price ? Hi Jenny, it does taste okay. Some better than others of course. The main draw is not really the taste, it's the price and portions. I think Cattle is a better value than Copa. And some items are indeed better. Holly, yah, no one had enough room for the waffles. Next time! T&J's eh? Well, at least they dropped the prices to align with their food quality. I had the opportunity to go at 1:30pm to try this place out. There was STILL a line-up. Although with a party of two, it was much faster. I could not imagine what this place was like during PEAK hours. Line-up could be 45minutes! Place is too cramped. I ended up having to help my server...serve me coffee, the entree, and cutlery. She could not reach my table because of a table in the way. Maybe I could have tipped myself. Heh. But agree. Large portions for good prices. There's no other cafe style place as competition in the area..as far as I know....right? Will likely go back. Anson, that place is way too cramped. But alas, it is the value quotient that rules here. Some items better than others though. I tried to have lunch at Cattle last week during lunch hour. The line-up was about 20 mins. I was by myself but that's no advantage, as many other parties waiting were for 2, and it seems most of their tables are 2-person. I gave up after 15 mins and went next door to Tomoya (Japanese). They are next door to Lao Shan Dong. Was seated, served hot tea, and given menu within a minute of walking in. Had the $9 combo (three items) which were huge in quantity and well-made. Been awhile since I've been to Tomoya, now I'll remember to go back more often.